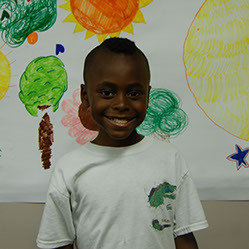 This unique six-week summer (2015) camp in the Homewood neighborhood of Pittsburgh gave 20 kids an education in energy science, climate science, art, design, and solar power installation. The final outcome was a built solar artwork—Renaissance Gate—designed by the campers! "This camp is about learning new resources and gathering new information. We will be making works of art out of solar panels while learning about how we can protect the environment." "My name is Elizabeth. I am 11 years old and I love track. My favorite animal is a panda. I am 4'9. 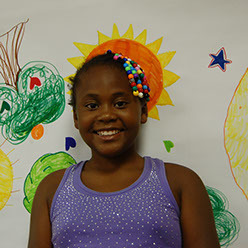 The thing I LOVE about this camp is that we learn about the environment." "Renaissance Gate means to me that once you walk through it you will come into a completely new Homewood. A new community without fear, without poverty, and without violence." "I feel the Renaissance Gate should inspire the community that in Homewood you don’t always have to use violence—and it’s a very nice community and it should be represented as one. The Renaissance Gate should stand for peace, non-violence, truth, justice. It should bring us and make us realize that we are all the same and one big family. " Hi my name is Imani Nanji. I go to art energy camp. It is a learning camp. When my mom and my dad told me I have to go to a learning camp I was mad. When I got there I really liked it! I love art energy camp. It is the best camp I have ever been to. I like all of the field trips. I also like when we go to the park. Week one of Art+Energy Camp was about understanding the entire landscape of energy generation in Western Pennsylvania—a window onto the existing conditions of our energy portfolio—while also understanding the global environmental and social issues around energy generation. Because Western Pennsylvania has a very high mix of coal-fired power, which contributes to consistently poor air quality in the Pittsburgh region, we felt it was important for the youth to witness a plant first hand. We visited a coal plant that contributes 17 million tons of CO2 annually. On the tour we walked along a 110-degree Fahrenheit catwalk—an embodiment of the lesson that they had learned the previous day about energy conversion and waste heat. We also visited a nearby nuclear power plant. The students raised lots of questions about the safety of nuclear vs. coal, which lead to some important conversations. We then contrasted these experiences by visiting solar installations and buildings with integrated passive and active energy efficiency systems. These experiences were then applied to benefit the local community. 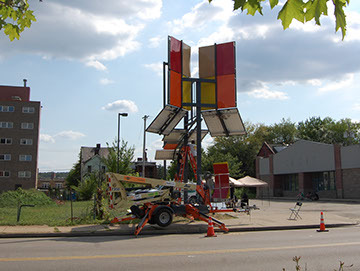 The campers designed a public artwork utilizing solar panels (4 kWp) to generate renewable energy. Fifteen modules have been installed in an arrangement that was conceived by the students with the principles of the Land Art Generator Initiative in mind. The process of concept generation was really interesting. We had conversations about the Homewood neighborhood and about words that capture what the campers want visitors to the artwork to feel. Together the kids eventually arrived at the idea of a “Renaissance Gate”—a passageway through which visitors can walk from the old Homewood into a Homewood of the future—a place of prosperity and opportunity for those who live here. Working from that concept, design sessions brought the kids together to collaborate on various 3D forms and configurations using the 17 panels. The kids incorporated the symmetry of a flower and offered pragmatic considerations for shade and protection from rain. 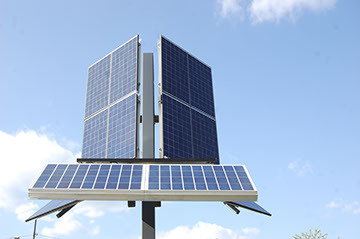 The solar artwork now provides clean electricity to help offset the demand load of the Homewood Renaissance Association facilities and provides a unique cultural amenity for the community, with a personal phone charging station that can be utilized by anyone in the neighborhood. The kids have been a driving part of the entire process. They have helped with documentation, social media, design, and meetings with consultants. When challenges presented themselves, the campers were there helping us to brainstorm solutions. The outcome for them goes beyond this particular solar artwork. In a sense, we have graduated project managers. It’s our hope that they’ll be able to apply this experience in all walks of life. Read what the Pittsburgh Post-Gazette, Inhabitat, and takepart write about this camp!